Tasting at the New Zealand Wine Fair in 2013. Bonus points if you can spot the ‘hopper. Photo from Facebook. 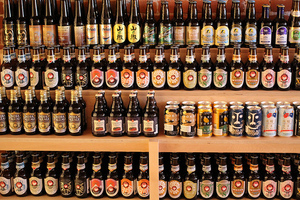 Some of the many fabulous Japanese beers now lining the shelves at Umami Mart in Oakland. Photo: Umami Mart. Did you know that this Friday April 24th is Sauvignon Blanc Day? It is! There are lots of ways to celebrate, including by getting yourself a glass and using the hashtag #SauvBlanc. You can put your knowledge to work the next day, Saturday April 25th, with the New New Zealand Wine walk-around tasting at Farallon. The tasting goes from 12pm to 3pm and will include pours from 24 of New Zealand’s finest wineries. There will be sauvignon blanc, of course, along with pinot gris, pinot noir, syrah, and more. Passed appetizers from the Farallon kitchen will be served, including many with New Zealand ingredients like smoked salmon, venison tartare, and lamb polpette. Tickets are $50, and the event runs from 12pm-3pm. 450 Post St. at Powell, 415-956-6969. 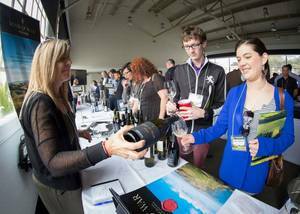 Then, on Monday April 27th, trade peeps can check out the New Zealand Wine Fair at Fort Mason from 1pm to 4pm. In addition to the walk-around tasting, there will be a seminar on New Zealand wines. Trade RSVP here. Fort Mason Conference Center Building A, Marina Blvd. at Laguna. The fab Bi-Rite Spring Wine Blitz is coming up from Monday April 27th through Sunday May 3rd, and you can get ready with a class at ~18 REASONS~ on Thursday April 23rd. The Spring Wine Blitz Preview will run from 6pm to 8pm, and will include tasting of more than 20 of the wines available at Bi-Rite, including many of the wine buyers’ favorites. Tickets are $20 for the general public and $15 for 18 Reasons members. Did you know that in 2013, approximately 93 percent of the wine grapes planted in California were made up of only eight different varieties? Yeah, crazy. Well, the Seven Percent Solution wants to change all that with a tasting of the other 7 percent, with a special tasting event with Bergamot Alley at the Folsom Street Foundry on Wednesday May 6th from 5pm to 8pm. Participating wineries include Unti, Stark Wine, and Arnot-Roberts. Tickets are $65 per person. Industry folks can also register for the industry portion from 12pm to 3pm. 1425 Folsom St. at 10th St., 415-795-3644. The fab ladies at ~UMAMI MART~ are celebrating their new Japanese bottle shop (the nation’s first, which we told you about here), Bottle System, on Tuesday April 21st (that’s today!) from 6pm to 9pm. The event will include bites from Casa de Kei and music, along with low-octane beverages (their license doesn’t allow open containers on-site, sadly). Be sure to check out the new bottle offerings, including their extensive selection of beer and sake from Japan, which you can bring home and enjoy. 815 Broadway at 8th St., Oakland, 510-250-9559. Also in Oakland is the opening of a new bar, ~WOLFHOUND~. We mentioned it last year, and now they’re open! It’s primed to be a neighborhood hangout, and a local friend reports that it’s popular and dog-friendly. The E’Ville Eye has some photos, as well as a cool story on the history of the space. 5516 San Pablo Ave. at 55th St., Oakland, 510-338-3023.